The Christopher Radko Buckle Up For The Holidays Ornament is a part of the 2018 Brilliant Treasure Collection. 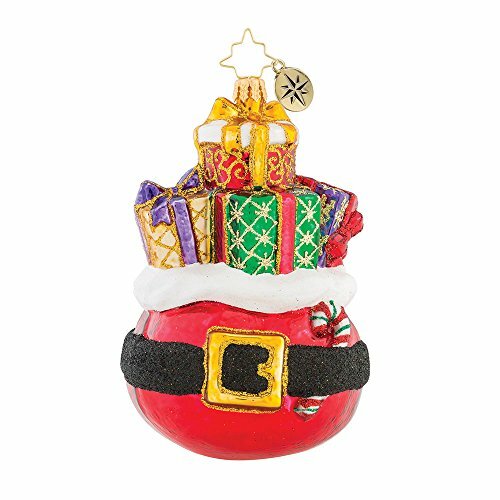 This ornament features a Christmas bag overflowing with elegantly wrapped gifts. The bag is inspired by Santa Claus colored in red and adorned with a Santa belt. The candy cane detail completes the ornament making it a treasure on any Christmas tree. The Buckle Up For The Holidays Ornament Measures 5"H. x 3.25"L. x 3.25"W.
All Christopher Radko Ornaments Are Mouth Blown and Hand Painted in Poland. This Ornament Features a Holiday Bag Overflowing With Elegantly Wrapped Presents. The Bag is Inspired by Santa Claus Colored in Red and Adorned with a Santa Belt. The Candy Cane Detail Completes the Ornament Making It a Treasure on Any Tree. The Buckle Up For The Holidays Ornament is a Part of the 2018 Christopher Radko Brilliant Treasures Collection.